We stayed 7 nights while visiting Branson. Campground is right off HWY 76 near the Titanic Museum so getting in and out of the park means dealing with a lot of traffic. The staff were very friendly and helpful. The utilities were well placed and worked well. The cable didn't have many channels, but they were clear. As with most parks in Branson you can purchase tickets from the office. Because of the terrain the park has a lot of tight turns and the sites are very cramped. The staff helps you get into your designated site and you'll need their help due to trees, etc. The laundry facility is excellent. Although the location is very good I would opt to stay in a park with a little more room between rigs. I will not stay here again. We camped at Musicland Kampground in a Motorhome. We camped at Musicland Kampground in a Motorhome. This park is owned by the Casino and is convenient to I-20 making it perfect for an overnight stay. It is clean and has a small pool and laundry area. The sites are mostly level with concrete that is a little short for pull through. The concrete pad is not angled to be convenient for exiting as other RV's are often sticking out in the road making it hard to get out. All in all it's an OK place for a short stay. The office staff is very helpful and polite. A free shuttle will take you back and forth to the Casino. We camped at Ameristar Vicksburg RV Park in a Motorhome. Small campground in the pines. Unfortunately they had just had a controlled burn in the park so it looked charred. Not much to do. Couple of short hikes to waterfall into sinkhole, which varies according to rainfall. It was only a trickle while I was there. There is a lake which has a small swimming beach. Nice picnic areas. No sewer, no Wifi, cell 2 bars on ATT. Site itself (16) was designated a pull through but not enough room to get my 36 foot MH in with out scrapping the sides with brush. Very tight space. This park is better designed for small RVs. Early departure ended with me stuck at the front gate with the gate arm malfunction. Finally called the park Manager who came down and activated the gate....said it always malfunctions with MH's.... Wish there had been advance notice of this issue. We camped at Falling Waters State Park in a Motorhome. This is primarily a Mobile Home park with sites available for short term RV Parking. The facilities were basic and worked as it should. The staff was very nice and helpful. WiFi was continuously disconnected but worked. The park was clean and quiet even though my site was near the highway. The location was easily accessible. 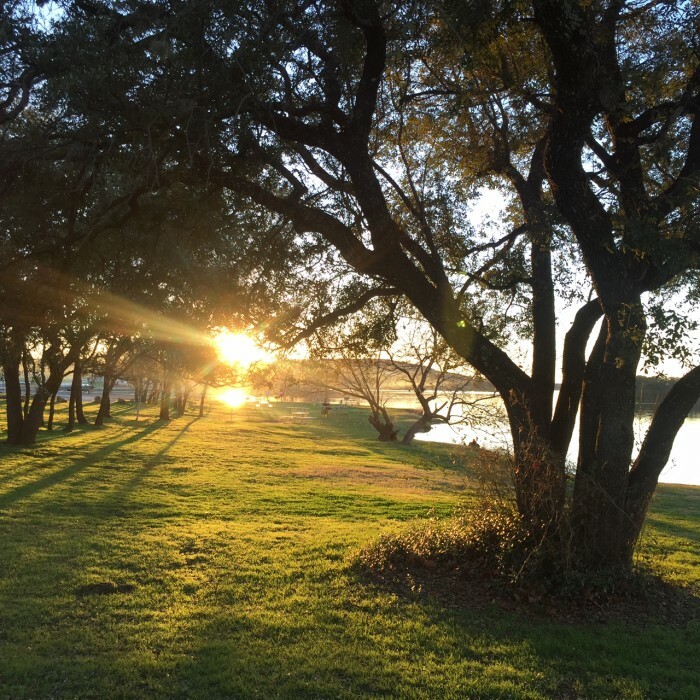 We camped at Cherry Blossom RV and Mobile Home Park (formerly Pecan Point RV Park) in a Motorhome. This is a very nice park. Everything works as it should and the office staff is very helpful. A tornado came through a couple of weeks before I arrived so they were still working on repairs. All is all I recommend this park to others. We camped at Anchors Aweigh RV Resort in a Motorhome. This is a pricey overnight. The park is clean and everything works as it should. However, there is damage to most of the palm trees as a result of past storms. It makes the park look a little ragged. Construction around I-10 to the park make it a little congested. The park is losing it's "Resort" theme.... We camped at Cajun Palms RV Resort in a Motorhome. This is a state park. It provides exactly what it advertises. No full hook ups but a great simi-private site in a nice location. The river is outstanding and a busy place this time of year.......come and enjoy it!!! We camped at Guadalupe River State Park in a Motorhome. This is a beautiful park with great facilities and lots to do (30/50 AMP, water but no sewer). There is camping, backpacking, hiking, geocaching, swimming, boating and fishing. Most campsites have good spacing from neighbors and some shade. There is lots of interesting geology and wildlife. There is a small grocery store, as well as canoe, kayak, and paddle boat rentals. Campsites are in good shape and close to the water. It is a very popular park, so reservations are recommended for weekends and holidays. We camped at Inks Lake State Park in a Motorhome. Stayed here for a week in a premium site. This is an outstanding park that is well run by a friendly staff. I've stayed in this outstanding location several times and will come back. An excellent choice!! We camped at Trailer Ranch RV Park (55+ Park) in a Motorhome. I camped in site #89 (30 amp electric only). Water tank fill stations on road to campsite. Be sure to fill up your tank because there is no water at your site in this park. It's a beautiful park with great hiking and abundant wildlife. It is not dog friendly but pets are allowed. Due to the remote location outside contact is limited. I was unable to get phone, Internet, TV, or radio at my site. It's a nice place but a little too remote for me. We camped at Mueller State Park in a Motorhome. Just passing through. Staff was helpful and everything in the park worked as it should. I would stay here again. We camped at Limon KOA in a Motorhome. Staff was nice and the park was clean however, the place is a little run down. We stayed in a pull though for one night just passing through. Would stay here again. We camped at Overnite RV Park in a Motorhome. I have to say that I didn't stay at this park. I had looked at past reviews and because I was passing through the area for the first time, planned to stay here for the night. I called ahead of time and asked for a pull through with full hook-ups. The guy I talked to indicated that that would not be a problem. When I arrived at about 3PM I was met in the office by a lady who told me to just go pick a site and let her know which one I took. I asked if they had cable TV and she said she wasn't sure but she knew that some campers used satellite dishes, not a warm feeling. We agreed in the office that I would take site 39 on the end near the exit. I drove around from the office to the site and found that it was to short for my 36' MH with out disconnecting my tow. I then circled the campground and found that ALL sites were to short. I returned to the office and explained that I couldn't find a site. The lady said why don't you take off your tow? I asked for a refund and left. I'll never stop here again. We camped at Lamar Sportsman's RV Center and Horse Motel in a Motorhome.